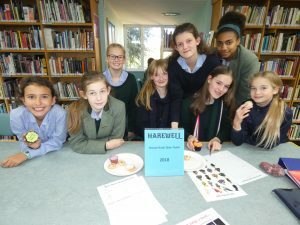 The seventh Inter-House Book Quiz took place in the Library on Friday 2nd November. Each house had a team consisting of 8 girls – one from each year group – captained by an UVI girl. Although everyone had a lot of fun, you couldn’t escape the air of competitiveness sweeping across the library; everyone wanted to win. Many congratulations to everyone who took part. All the teams showed an impressive level of literary knowledge from Potter to Prometheus, Shelley to Sedgwick. Tactics also played a part, with the team captains brandishing their Joker, Lady Luck and Ask a Teacher cards at appropriate moments. Despite five rounds of wide ranging questions, the final result was incredibly tight with Newby, York and Harewell all scoring highly. And the winner is…going to be announced in assembly next week!